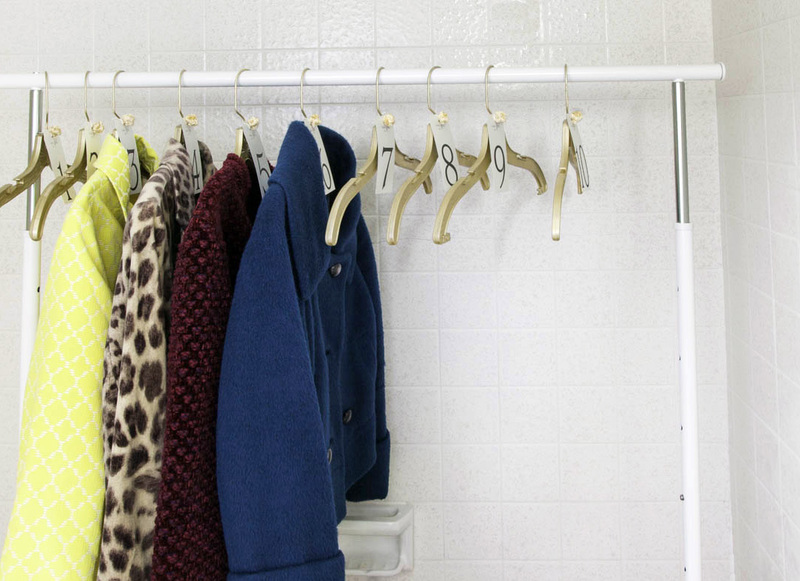 I’m throwing a cocktail party in my petite abode in a few weeks, and one of my favorite space-saving tips is to put a portable wardrobe rack in the bathtub for coats. I live in NYC, and it is still very chilly in March. Guests are going to arrive with bulky coats and scarves, and I want to be prepared. I don’t love putting dirty coats on the bed, but there is not an inch to spare in any of the closets. Time to get resourceful. Since my tub is very narrow, it was hard to find a portable, collapsible rack that would fit. 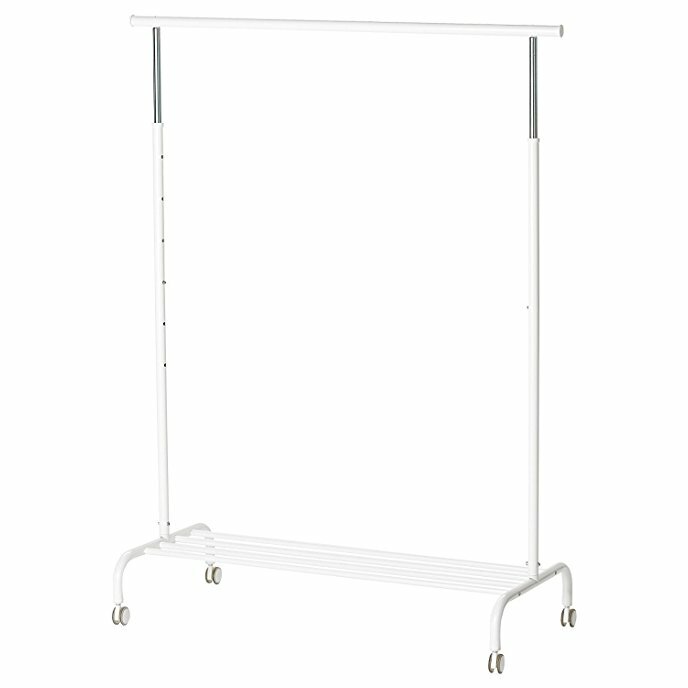 But the ever dependable small-space decor source, Ikea, came to the rescue with the Rigga rack ($12.99). When not in use, it disassembles easily for skinny storage. I tried using a cheaper plastic and metal model, and it started to bend after a few coats were hung. Invest in an all-steel or metal construction, or it will not be worth the money. No plastic parts please. • Spray paint clear plastic hangers gold or a fun party color to match your theme. Color blocked hangers look neater. • Tie large wedding table number cards on each hanger for each coat and guest. 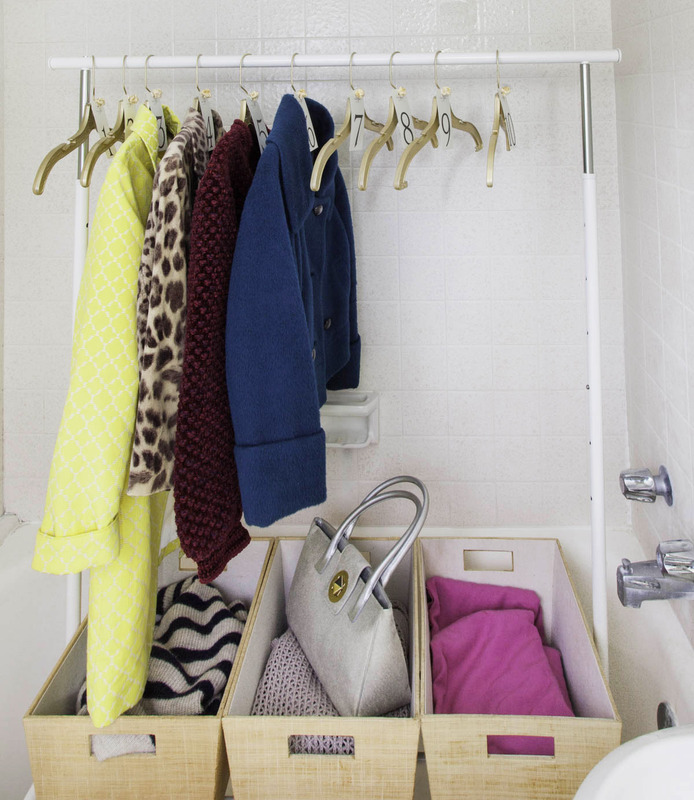 • Place baskets on the bottom to store purses and backpacks. For more unique entertaining in a nutshell of a space tips, click here. OK, now I have to think about the menu…so much to do. Give it a whirl at your next party! I am finally coming clean with the fact that I am a liquid soap girl. I used to offer guests both a fresh bar of soap and a liquid soap option, but it is so wasteful throwing out a gently used bar of soap. 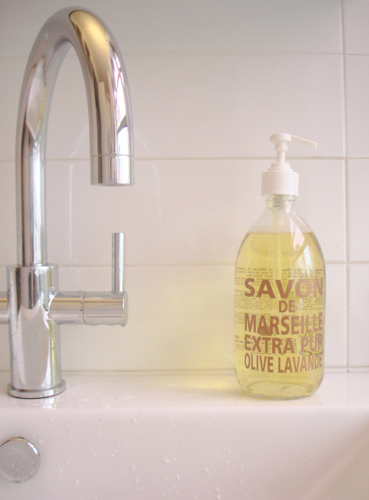 Now liquid soap is all that I have on the sink. 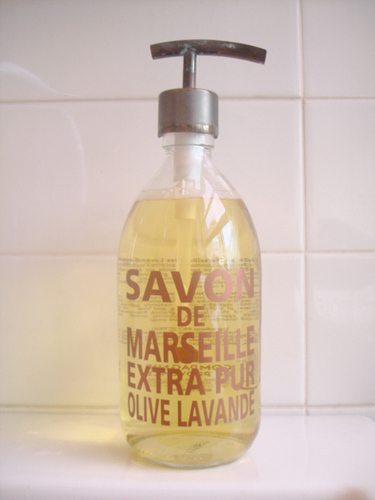 My current favorite is Savon de Marseille—a wonderfully fragrant liquid soap line that comes in a chic glass bottle. I didn’t love the white plastic pump top that it comes with so I upgraded it. The pewter pump is from onedreamdesign.com. 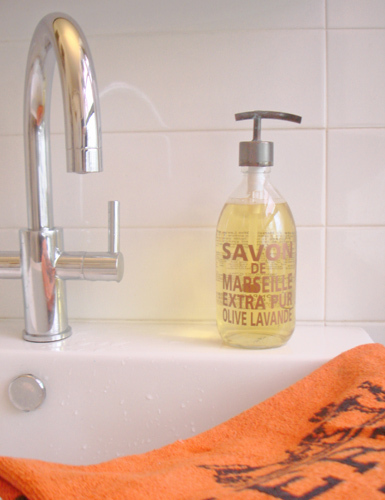 You can always refill with a less expensive liquid soap brand. I refill mine with a lavender-scented generic. Don’t tell! Cake stands and footed platters are not just for the kitchen anymore. I long for the day when I can sit at a luxurious dressing table applying perfume behind both ears. Cue the ghost of Jean Harlow now! 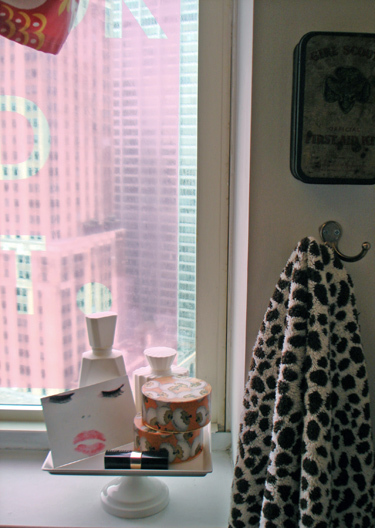 Until that day arrives, I like to pile makeup, soap and vanity accessories on top of a cake stand that sits on the bathroom window ledge. The footed platter adds just a touch of girly-glam to a rather ho-hum bathroom. Stack them up to maximize vertical storage space in a tight corner. This footed platter is part of Martha Stewart’s collection at Macy’s and it is currently on sale. Vintage Coty face powder boxes remind me of what my mother used when I was growing up. They have a permanent spot on the vanity pedestal. For a personal touch, I glued false eyelashes to a postcard and added a freshly-kissed lipstick stain in my favorite shade of red. Love is in the details so dress your petite abode with what makes you happy. Here’s a quick way to make your own footed platters that you can take apart and store away. Check it out here. Adding a new accessory to my home makes me happier than buying a new pair of shoes…and I love my shoes. 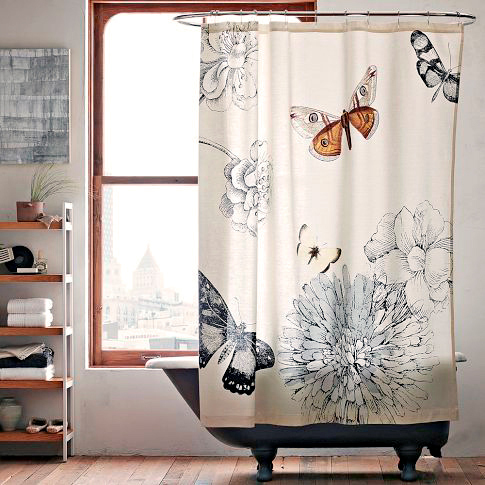 I had the same shower curtain for a few years (it looked brand new) but it was time for a change. 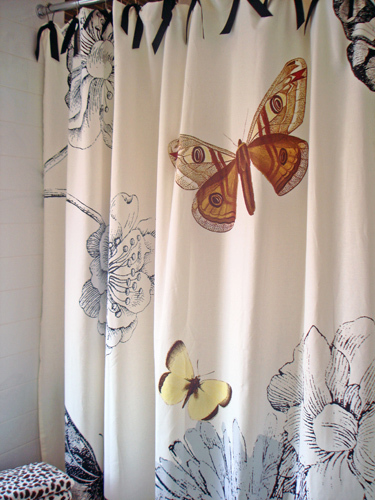 I picked up the Butterfly Shower Curtain from westelm.com because it happily coordinated with my existing towels and bathmat. To give it a more personal touch, I tied black grosgrain ribbon on each loop. 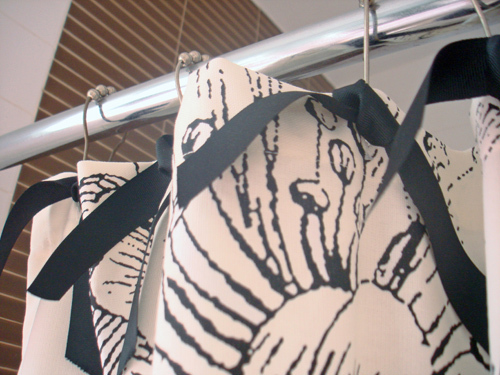 I always keep a large roll of black ribbon in my decorating kit. It’s cheaper by the roll and I use black ribbon to adorn so many different things. I prefer using a fabric shower liner instead of plastic ones. When it gets dirty, it goes in the wash with bleach and it’s as good as new. The plastic ones get moldy so quickly and I always feel bad about throwing a big piece of plastic away. Enjoy! They say “love is in the details,” and it was certainly love at first sight when I received a box of wood-grain, “faux bois” soaps from giannarose.com. They are the perfect guest soap size and they smell heavenly…with just the right touch of grapefruit, clementine and green tea. 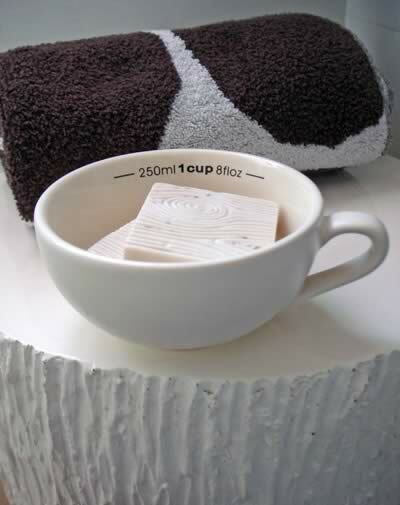 I keep the soaps in my Nigella Lawson measuring cup, which sits on my white resin, wood-textured “stump” in my bathroom. It’s the littlest things that can make you smile. 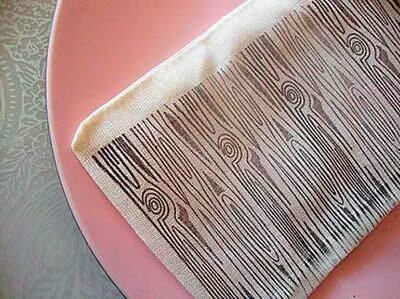 I also recently discovered these wonderful hand-printed, wood-grain wedding favor bags in muslin at etsy.com. Pair them with these soaps, and you’ve got a memorable gift for all of your guests.